The objective Zola Jesus set herself for her fourth album was to face her own fears about how her love for pop music would eventually have to inform her work and what that might sound like. It is significant maybe that the oldest song here and the one that finally forced Jesus into the glare of potential mainstream and started the ball rolling, “Dangerous Days”, is also the purest pop song on “Taiga”. It has a brightness that contradicts its title, a brilliant pre chorus, an actual chorus which is only slightly less captivating and a sonic energy that’s slick and addictive and brings to mind the slightly more intricate and risky songs from Madonna’s mighty “Ray of Light” album. The remainder of Taiga is not really a pop record although it frequently aspires to be one. Soundscapes are stripped almost entirely of any of the glitch that featured on 2011’s “Conatus” or the muddy density on her brilliant breakthrough album “Stridulum II” and replaced by something that is undeniably big and rich but simpler and more concentrated than before. A lot of the songs have beautiful, powerful intermissions; it’s just that too frequently the melodies are lacking the strength to push these tracks to required level, the one which you presume she had in her sights. Dean Hurley co-produces with Jesus and is an odd choice given his primary job as David Lynch’s new sound man, responsible for producing both of Lynch’s inconsistent and naive solo albums, and hardly a name synonymous with making music that can be sung along to. There are references here to the Ryan Tedder meets Sia school of Beyoncé power pop on the crashing but dull “Lawless” and the Rihanna-phrased “Long Way Down” but neither songs would pass the pop queen’s test of a tune that hijacks relentlessly. The more successful tracks, and “Taiga’” is the definition of a front-loaded album, happen in the first half. “Dust” has a woozy, avant r’n’b doo-wop swing which is hypnotising and commercially-minded and “Go (Blank Sea)” like Petula Clark, and hundreds after her, successfully sees Jesus pining for the eternal pop never-never land of “Downtown”. “Hunger” has a thrusting and bewildering attack of beats, brass and synths -- at one point it’s hard to distinguish between the two- and a glacial, persistent string part and is exhilarating and sharply euphoric. “Ego” is a suspended hymn of considerable power where all of “Taiga”’s elements fall into place; a lucid and possessed vocal interrupted by sheets of brass that morph effortlessly into aching strings. The ongoing presence of strings and brass in particular bear out the theory that “Taiga” is more of a continuation of the stripped down “Versions” of last year then something you might hear in a bar. From here on in and midway through “Taiga”’s playing time the focus is lost, however, and gives way to repetition and mediocre tunes. “Hollow”, for example, attempts to salvage some drama and presence but is an oddly similar reimagining of the far superior “Hunger”. Since the release of “Taiga”, Jesus has been remixed by the likes of The Juan Maclean and Diplo, a still relatively underground sophisticated pop-dance act, and the man rumoured to be producing the next Madonna album. Both artists have done commendable jobs in highlighting the hooks in what were admittedly already two of the album’s stronger songs (“Dangerous Days” and “Go”). Where their real strength lies, though, is in taking Jesus’ music to a demographic previously unaware of her and potentially initiating an interest to investigate further. This is where Jesus and “Taiga” stumble as the initial promise of something different and more accessible is never really delivered so new fans are unlikely to convert and current ones will be dissatisfied at the loss of the incredible depth and half-shaded mystery that permeated her earlier work. 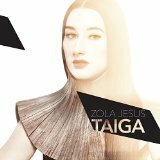 A good album still with some great songs but “Taiga” doesn’t quite provide the soundtrack that Zola Jesus commands and deserves, whether she continues to chase her big pop arrival remains to be seen but you feel that this isn’t it.